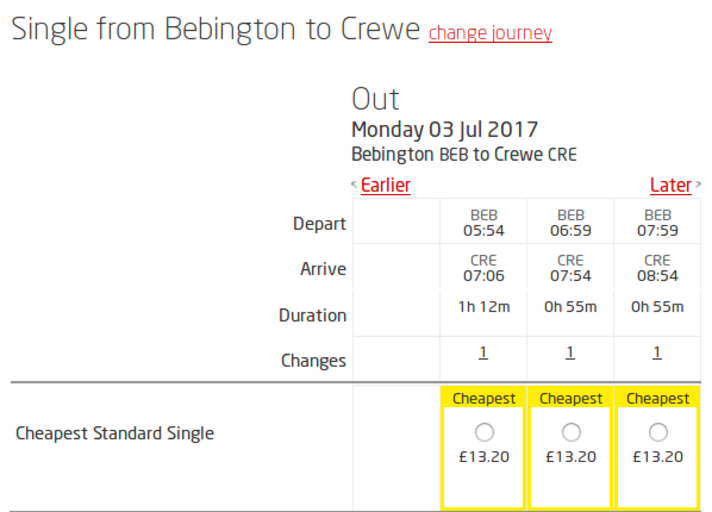 This is the first of what might become a series on Virgin Train Ticket Search Oddities. I'm planning a significant set of travels, so as always, I started by sketching an idea of what might be possible, then confirmed the various parts on the usual National Rail web site. 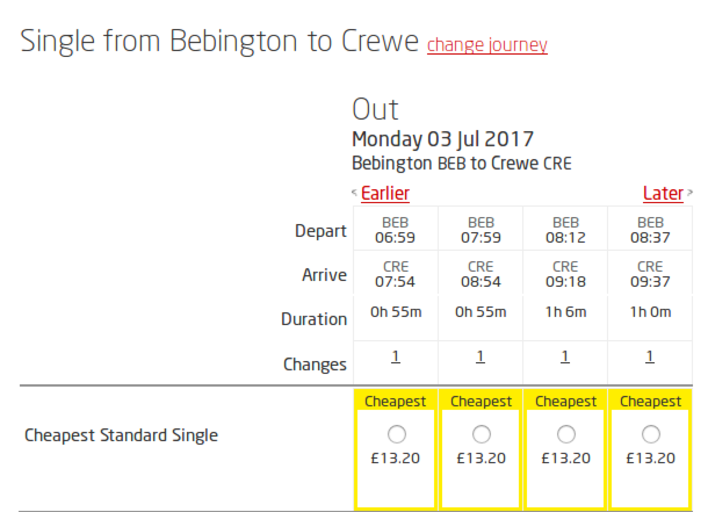 Having picked my trains, I would then go to the Virgin Trains web site to actually buy the tickets. So I wanted to check the trains a little earlier than that, so I refined my search to look for trains arriving before 09:00. Exactly the same search parameters, including the date, just that the time of arrival has now been set to "before 09:00." The search box is shown here on the right. And below are the results. Have a look. Have a close look. In particular, have a look at the date, and the times of the trains. 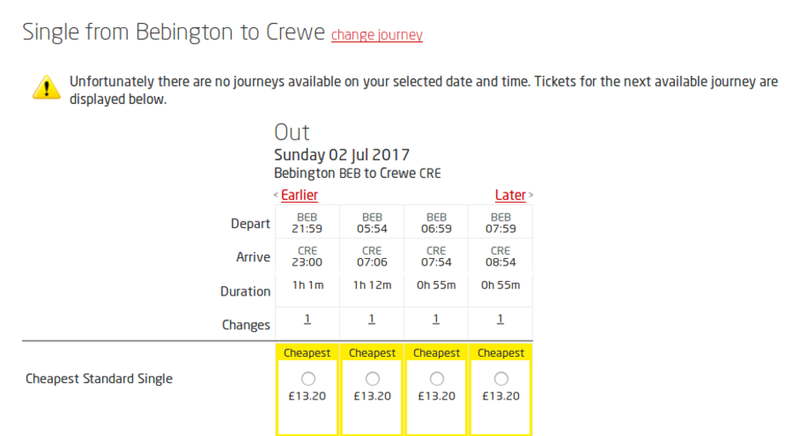 It's claiming that there are no trains matching the search parameters, and it's giving me results for the previous day. But in a generous reading, the first of those trains is the last train of the previous day, and the other three are the first three on the requested day. So in truth, these results do match my search parameters. Clearly it's just wrong to say there are no trains. I mean, I know that there is a train arriving before 09:00, and it's actually shown in the table of results. 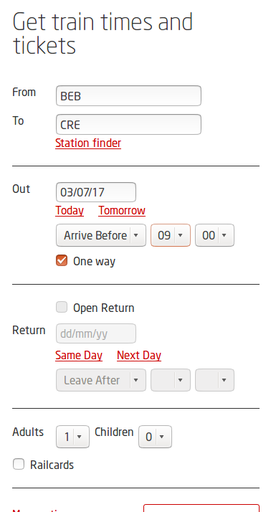 And yet now it claims there are no journeys matching my requested date and time, and then three out of dour of the displayed results do. Curious, to see what would happen, I clicked on the "Later" link, and then from there on the "Earlier" link. I have to say, the updates are very swishy, with all sorts of subtle animations making it look very fluid. Lovely design, lovely effects, smooth, clean, elegant. All the gorgeous design is totally irrelevant if you don't actually get the right results. How much time has been spent making the site beautiful, and it still gives the wrong results! Very frustrating, and leaves me with a complete distrust of the site. What is the purpose of the site? What is the one thing people come there for? 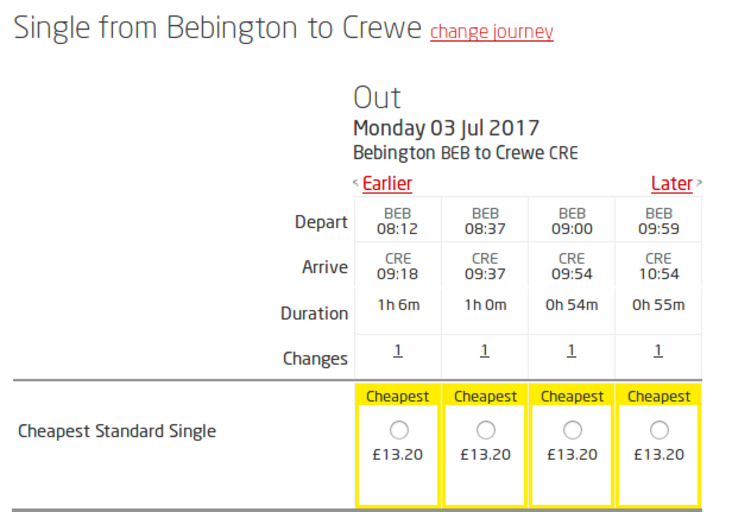 To find train information, and hence to buy tickets. It's a bit of an "internet meme" these days, and not necessarily very useful, or enlightening, or helpful, but even so, this seems like the perfect time to say it.